Winds aloft this morning have an easterly component from 700 to 300 mb. The flow is advecting the smoke plume from the Gila Wilderness fires across southeastern Arizona. Above is 300 mb, 12 UTC analysis (from NCAR) showing the northeast flow, east of an upper anticyclone that's currently centered over California. Visible satellite image at sunrise today (below) shows the large smoke plume from southeast Arizona eastward across the Texas Big Bend country. The NWS forecasts a high of 108F for the airport tomorrow, so no relief in sight from the heat and drought. David Cristiani sent the above photo from has camera. The photo, taken between Socorro and Truth or Consequences on I-25 yesterday morning, shows smoke from the fires hanging low in the Rio Grande Valley. Finally, photo above shows an active portion of the fire burning yesterday afternoon (USFS photo by Steven Meister, Mt. Taylor Hotshots). Since there's little to talk about locally, I'm going to discuss some of the weather we observed on the Big Island of Hawaii earlier this month. We were on the Big Island from 6 May until 9 May and we stayed in the small town of Volcano. See the map above. 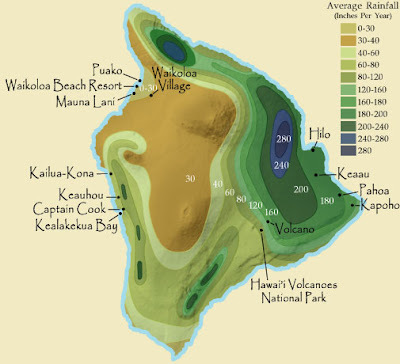 Volcano is south-southwest of Hilo and is at an elevation of almost 4,000 ft MSL. Each day the clouds would fill in and more or less steady precipitation would begin just before dark. The rains were quite heavy each night, but ended around sunrise. The exception was May 8th which had light rain continuing through most of the day.Volcano receives about 160 inches of rain each year and is definitely about as different from Tucson as one can imagine. I was curious about the diurnal cycle we observed during our days at, and near, Volcano and took a look at the upper-air soundings from Hilo. What I found was quite interesting. Above and below are four 1200 UTC soundings from Hilo (obtained from the University of Wyoming uppper-air page). At the longitude of Hilo, 1200 UTC and 0000 UTC occur at 2 am and 2 pm (respectively) local time. Each of these soundings (taken during the time that substantial, nocturnal rains were falling in Volcano) exhibit layers, or levels, that have absolute moist instability. Such layers (MAULs) were identified by Bryan and Fritsch in 2000 (see http://journals.ametsoc.org/doi/pdf/10.1175/1520-0477%282000%29081%3C1287%3AMAITSS%3E2.3.CO%3B2 ). They were studying deep convection over the continents; however similar, but more shallow, layers appear in the Hilo soundings. The instability in the Hilo soundings reaches only to about 700 mb. However, given persistent, upslope trade winds, these soundings were associated with nearly continuous light to moderate, nighttime rains. The rain was clearly produced by warm processes and the small-drop, high moisture contents of the clouds frequently cause sonde problems when the soundings penetrate into the warm and dry air above the clouds. 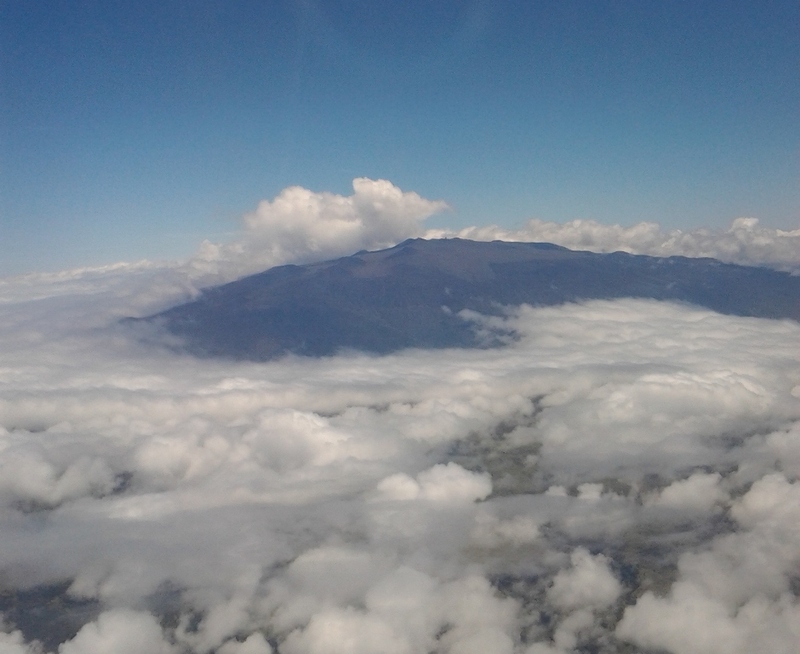 Photo below is from our flight departing Hilo at about noon on May 9th; view is looking south toward Mauna Kea volcano (elevation 13,796 ft MSL). There appear to be at least two different boundary layers at this time - one is filled with shallow cumulus between the plane and the mountain. Over the mountain, cumulus, while still shallow, clearly have higher bases. So, that's the account of our brief encounter with the complex meteorology of the Hawaiian Islands. Tropical Storm Beryl is weakening this morning over northern Florida - see visible satellite image above. Beryl was first identified as a subtropical storm because of its direct association with an upper-tropospheric low. 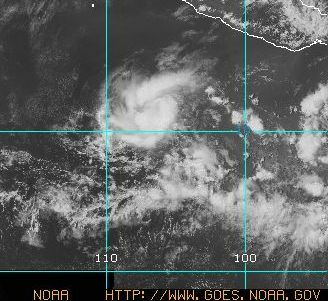 However, during the past 36 hours, NHC reclassified it as a tropical storm as it became somewhat independent of the upper-low and acquired warm core characteristics with maximum vorticity at low-levels. A very interesting evolution for this system. Radar-estimated rainfall (below) indicates possible amounts over north-central Florida near 4". 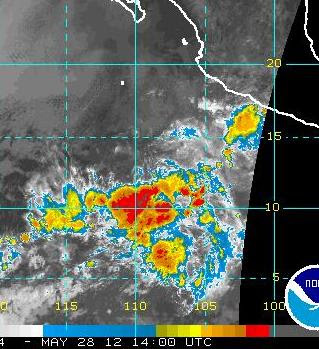 There is also a large area of deep convection over the east Pacific this morning (below). There seems to be a bit of circulation associated with this cluster, however, NHC does not expect any development during the next couple of days. 122,388 acres as of Sunday morning with 0% containment. 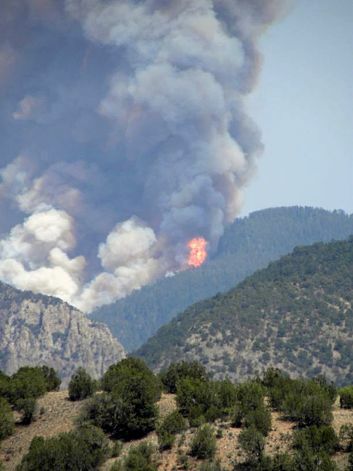 It will likely become the largest fire in New Mexico history. Low temperatures: the lows here at the house have been quite cool - 45F on Sunday morning and 44F this Memorial Day morning. Quite chilly at sunrise. Consecutive days with no measurable rain here at house - 45 days. The fire in the Gila Wilderness in New Mexico (officially called the Whitewater-Baldy fire) has burned approximately 85,000 acres (photo above from the the incident center). 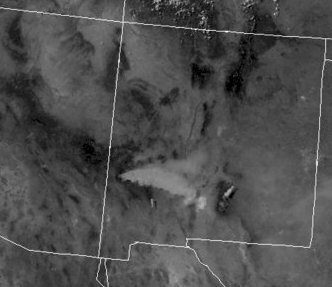 The 1415Z UTC visible satellite image below shows the smoke plume heading off to the northeast toward Albuquerque. 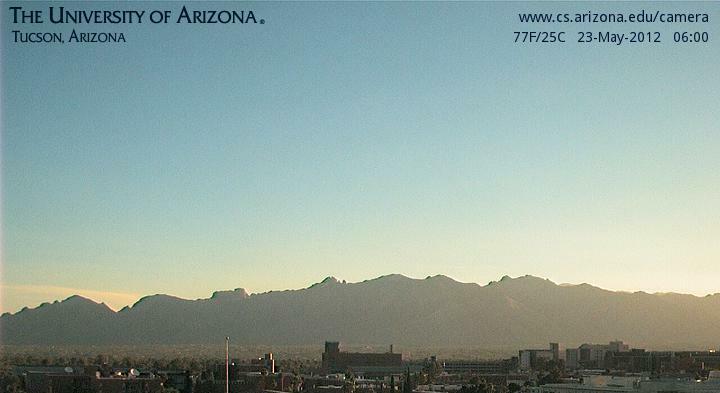 Image also shows perfectly clear (and dry skies) over the Southwest. (Note for those who might not know - bright white area on the east side of image is White Sands.) The blended PW product (bottom) shows very low values over the eastern Pacific along and south of 30 N. Summer rains are still a long way off - unfortunately. The piece starts off with: "Even a spate of recent temperatures in the 105-degree range cannot explain the latest doings of government by crackpots." And finishes up with: "There’s no mystery what a nation run by the Tea Party and talk-radio zealots who’ve taken over the G.O.P. would look like. It would be Arizona....The people who now control the state are proof of the old saying that in a democracy, voters get what they deserve." Bud is now a Cat. 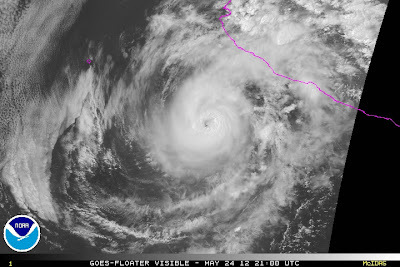 2 hurricane and latest forecast is that it will make landfall (south of Cabo Corrientes) as a hurricane. 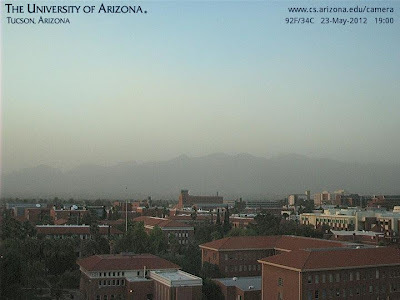 The skies at dusk yesterday were laden with blowing dust - very bad days for allergy sufferers. The NWS forecast for the next couple of days (below), indicates continuing misery. Update re now Hurricane Bud (IR image of Bud above), a Cat. 1 hurricane with 90 mph winds. After the NHC changed its forecast to keep Bud at TS levels, the storm strengthened rapidly and became a hurricane. So it goes sometimes in the weather business. 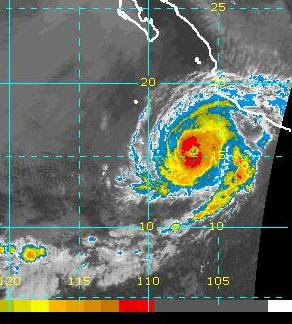 Current NHC forecast below indicates that Bud will approach Mexican coast and then turn back west into the Pacific. 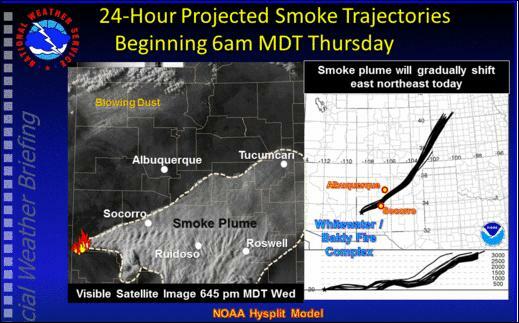 A forecast for the large smoke plume from the Albquerque NWS Forecast office this morning (above). The fire continues to produce a large smoke plume, as per satellite portion of above graphic. Note the distinct wave structures on the top of the plume. I think that the fire may be threatening the Gila Cliff Dwellings National Monument, a special place that I have visited a number of times. Winds are very strong across southern Arizona and southern New Mexico this afternoon. I estimate gusts over 40 mph here at house during past hour. The strongest gusts I found in southeast Arizona around 1 pm MST were 56 mph at Ft. Huachuca. With almost no rainfall since mid-March, fire conditions are extreme. The above visible image (a bit after 1 pm MST) shows a large smoke plume from the Baldy fire in the Gila Wilderness north-northwest of Silver City, New Mexico. This fire has apparently blown up with the onset of the strong winds. Surface plot below is also from a bit after 1 pm MST. David Blanchard has a nice time-series image of Sunday's solar eclipse (taken from rim of the Grand Canyon) posted on his blog - link is to the right. High temperatures at TUS reached 105F on both Monday and Tuesday, with extremely dry conditions continuing, as RH dropped to a reported 2%. So little moisture in the atmosphere that it's difficult to measure RH accurately. Another out-of-state hiker has perished in the extreme conditions. A German tourist collapsed and died on the Hugh Norris Trail (west of town in the Tucson Mountains) at about 2 pm on Monday. This trail has a steep rise and should only be tried during the early morning hours this time of year. Tropical Storm Bud (IR image this mornining is above) continues moving toward the northwest as a marginal TS that has not strengthened as NHC had forecast earlier this week. Bud is now forecast to remain a TS, turn northeast toward Mexico, then weaken and loop away to the west with no landfall. 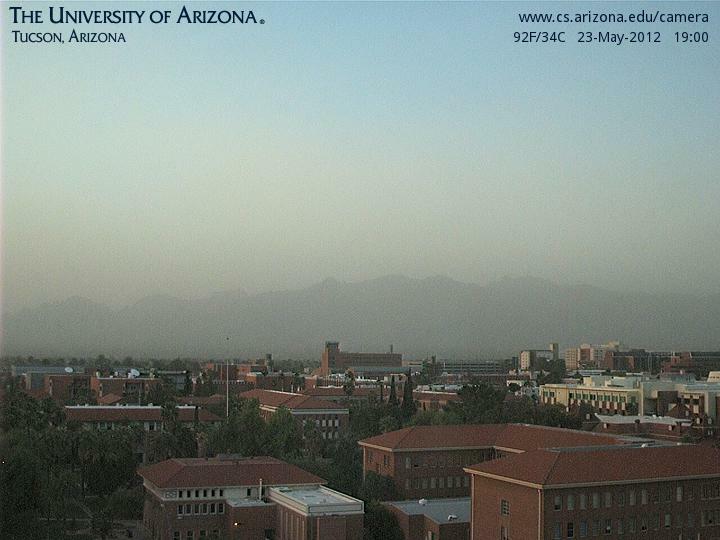 Afternoon winds continue to keep some dust and pollen kicked up each afternoon, and the air has a hazy look to it at sunrise this morning, as per above view of Catalinas. Situation will worsen as a 500 mb trough sets up over the west. Two shortwaves will swing by to the north today through Saturday, kicking up evenstronger winds during the afternoons. Temperatures will cool down but dust and fire dangers will increase. The early run of Atmo's WRF-GFS model forecasts hot and dry weather for next two days - no surprises there, since June is approaching. 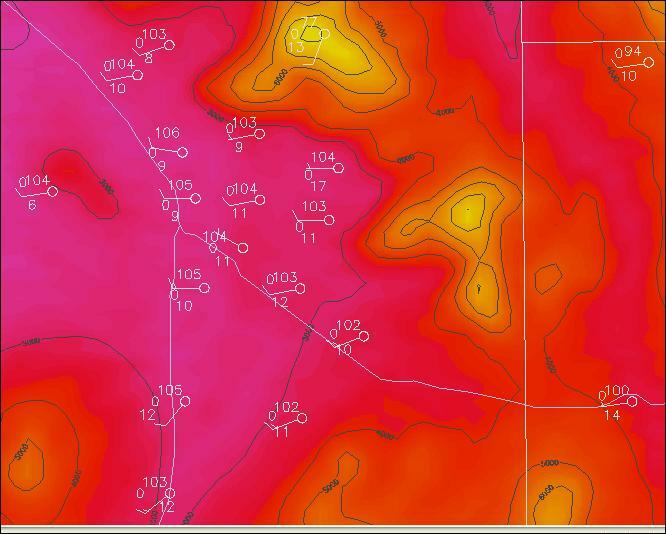 The tabular forecast from the model is shown above, with TUS high temperature forecast at 104F today and 103F tomorrow. The airport hit 100F yesterday, with afternoon RH dropping as low as 4%. Looks like the model forecasts the hottest air to be hanging over the University, with highs of 105F each of next two days. 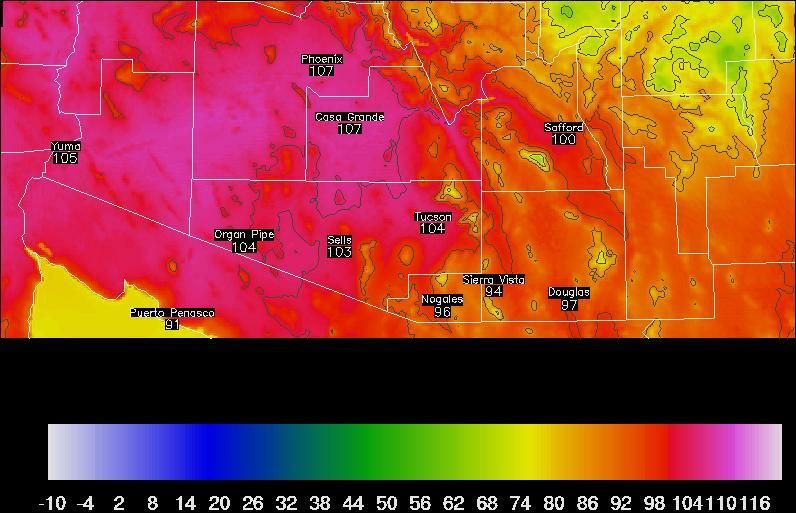 Below is the model's forecast temperatures for 4 pm MST this afternoon. The morning low here at the house was 54F, so the diurnal swing today could be 50F or a bit more. The latest NHC forecast (below) indicates that TD-TwoE will intensify to hurricane strength and become Hurricane Bud. 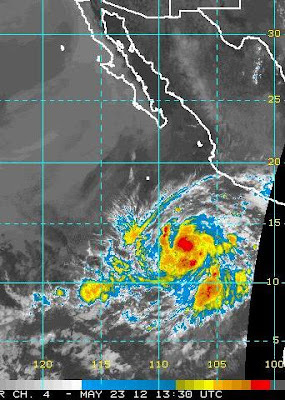 The storm is forecast to turn north and then northeastward later in the week, eventually making a landfall somewhere along the Mexican coast. 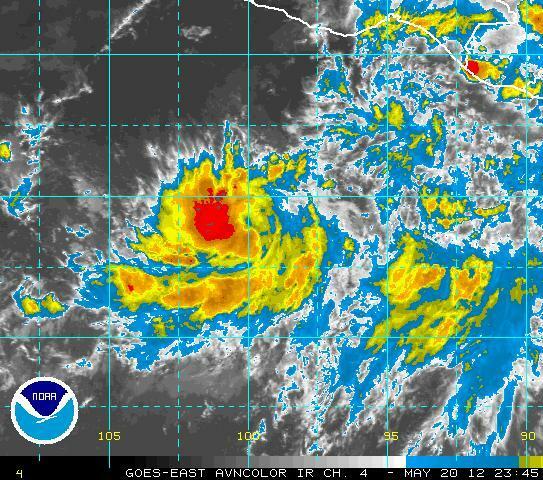 While attention has been on Atlantic TS Alberto this weekend, it appears that another tropical storm has formed in the eastern Pacific. Satellite loops show this system spinning away near 100 W and 10 N this afternoon. Above visible image is from 4:15 pm MST and IR image below is from 4:45 pm MST. We're having a serious flurry of early, tropical storm activity this year - will it continue? Just took a look at the ATMO WRF-GFS forecast for tomorrow (from the model run initialized at 12 UTC this morning). Above is the forecast surface plot for 3 pm MST tomorrow afternoon. 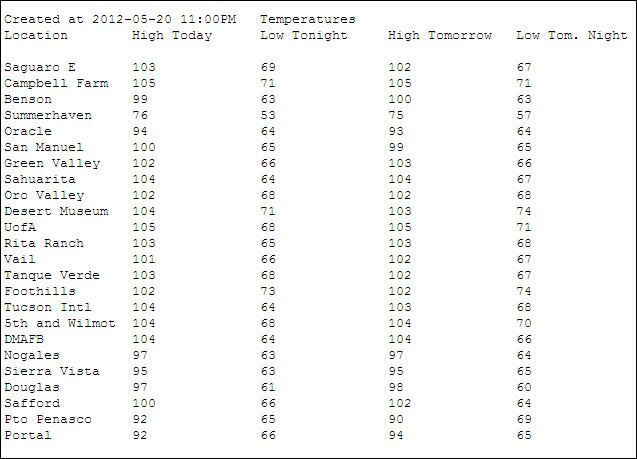 Temperatures across the main metro area are forecast to range from 103 to 106F, with dewpoints around 10F. A young hiker died of heat stroke yesterday on Wild Burro trail in the Tortolita Mountains northwest of town. Very important to keep hydrated in weather like this. 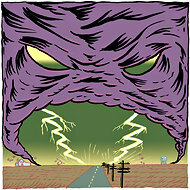 There's not been much weather to comment upon lately, and I'm going afield this morning (Sunday, May 20, 2012). This morning's NY Times has two articles that I found interesting, since I've been through all three towns mentioned. First, within the Book Review section, there is a review of "Wichita," a novel, by Thad Ziolkowski. The author throws around some lines from Rilke ("You are not surprised at the force of the storm - you have seen it growing." and "Through the empty branches the sky remains./It is what you have. "), that are appropriate for the theme of the novel. The protagonist has just graduated from Columbia and his father expects him to head for graduate school. 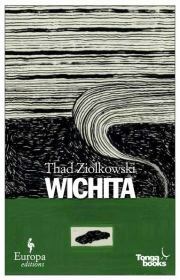 However, his mother, who is divorced from the father, suggests that he return home to the healing powers of the Plains, i.e., come back to Wichita. 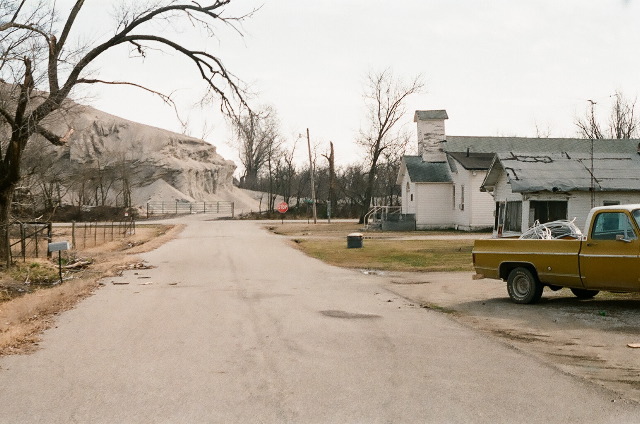 The mother has a start-up business; she runs a newly-formed, storm-chasing company. Finally, after a successful chase, the protagonist says: "To chase a storm is to play games with death, to indulge one's mortality and feelings of immortality." Sounds perhaps like some of those out there clogging up the Kansas roads on big storm days. (Note - I've only read the review, but the book is on the shelves of your local bookstore(s). The Arizona wildfire season seems to be off to an early start. The map above shows the location of wildfires currently burning (red dots) in the U.S., and areas under Fire Weather Watches (yellow) and under Red Flag Warnings (red). 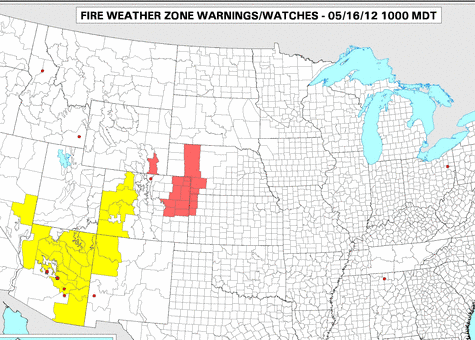 Four wildfires are currently burning in Arizona. 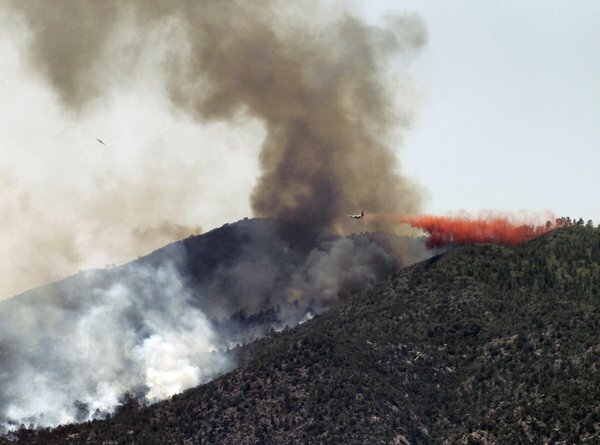 1 - The Gladiator fire near Crown King, which has forced evacuation of the remote town in the Bradshaw Mountains. 2 - The Sunflower fire near Payson, in the Mogollon Rim country. 3 - The Bull Flat fire on the Fort Apache Indian Reservation. 4 - The Elwood fire on the San Carlos Indian Reservation. Photo above (from the AP) is of the Crown King fire. 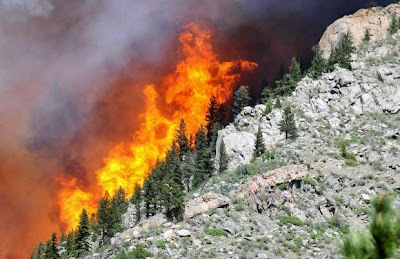 Photo below (not credited) is of the rapidly spreading Hewlett fire in the Poudre River Canyon northwest of Fort Collins, Colorado. TS Aletta - near 110 W in visible satellite image above - is weakening and is currently a marginal Tropical Storm. To the east of Aletta, another cloud cluster is trying to organize near 97W. 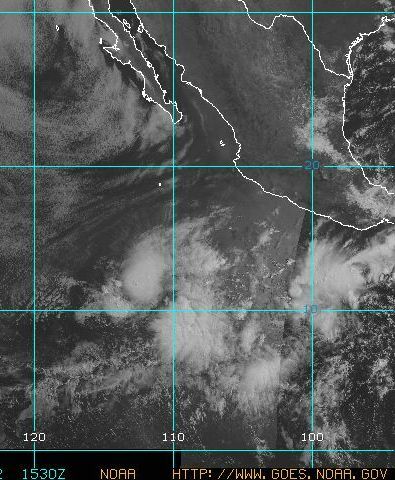 Ron Holle commented below that I had stated the Eastern Pacific Hurricane Season wrong - NHC defines the season for the East Pacific as 15 May through 30 November. So, the start of activity is not as early as I had thought. With the onset of very hot and dry conditions over the Southwest, it seems time for my annual reminder that the NWS RRS soundings continue to have problems accurately measuring RH, leading to unreliable calculations of precipitable water (PW). The two time series above show GPS PW (blue) versus RRS sounding PW (green dots) for the past 5 days at El Paso (top) and Tucson (just above). The PW values are usually too low for the RRS sounding data, as per the typical hot conditions situation with sounding RH too low near the surface. The 5-day time series for Flagstaff is shown below. The sounding data for 00z UTC on 13 May were much drier (about 0.5 cm) than were the GPS data. The Flagstaff upper-air sounding for this time is shown in the skewT plot at the bottom. The sounding has a huge dry spike from the surface to 550 mb, where the RRS RH is too low. So, the bottom line is that users should beware during the next few months. 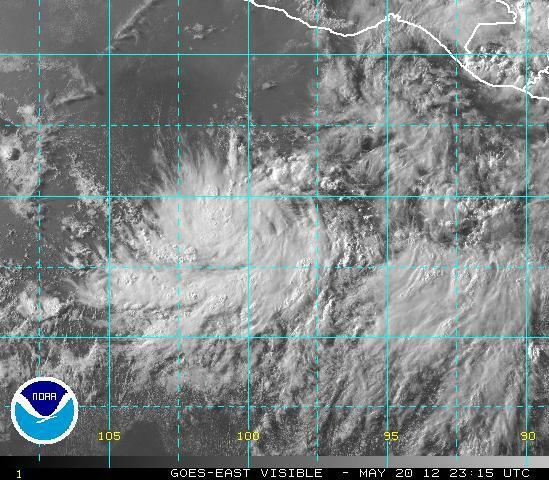 It appears that the first tropical storm of 2012 is developing, well before the start of the "official" Hurricane Season (June 1st). A visible image of TD ONE-E at 2 pm MST is shown above, and the NHC forecast is shown below. Statements from NHC indicate that system is near Tropical Storm strength and it is forecast to intensify with wind speeds reaching around 50 mph. The TS will be named Aletta. An early start for tropical activity in the Eastern Pacific. LATER TODAY OR SUNDAY...IF NECESSARY. There is some tropical activity in the eastern Pacific as per above NHC outlook and discussion. Seems quite early to me. Build 13, to be deployed this summer, will have CMD once again. So we can expect some improvement in clutter removal. This information confirms what I had noted in previous post and also that this step backward wrt clutter will be sorted out this summer. Meanwhile, I assume that rainfall estimates, such as the storm total product from KYUX (Yuma) valid at about 1400 UTC this morning (below), are going into the level 3 data archives. Regional radar images from the Southwest are interesting this morning. A visible satellite image (above, for 1345 UTC) indicates that clear skies dominate, except for the ocean stratus along the west coast. However, a regional radar chart (below, for 1400 UTC - from NCAR website) shows widespread echoes over the northern GoC and southern California (reflectivities of 20-25 dBZ over a fairly large area). Out to the northwest of Phoenix there is what appears, on radar, to be a convective storm with reflectivities of 50+ dBZ. This echo had a radar-estimated rainfall of around half an inch when I checked (I refer to this kind of radar-estimated, false rainfall as "rock rain"). 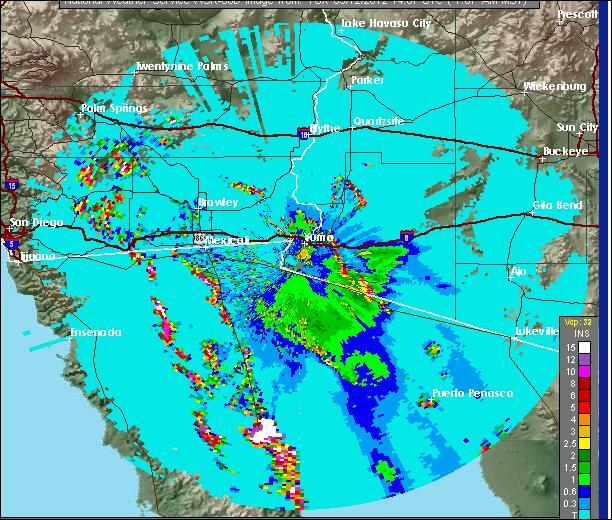 The echoes are mostly ground clutter that was not removed by the filters on the NWS WSR-88D radars at Phoenix and Yuma in Arizona. Ground clutter that passes through the filters has long been a problem on these two radars. However, the problem seems to have worsened some (after several years of improvement) with the addition of dual polarization - at least at Tucson and Phoenix (I don't know whether the Yuma radar has been upgraded yet). Radar loops indicate that there are two regions of translating echo - one is in southern California and the other along the east coast of the GoC in Mexico. These echos are likely insects or birds, however, the bulk of the echoes at 1400 UTC are just morning ground-clutter. The primary issue related to ground-clutter rain occurs in long-term research efforts that use radar-estimated rainfall from the WSR-88D archives as "ground truth". Over long-periods of time, there can be considerable contamination of the archived data. Researchers would have to detect bogus rain estimates via some form of quality control efforts. The ground clutter to the northwest of Phoenix, for example, used to produce substantial, rock rainfall accumulations (I have observed amounts over an inch on many occasions). Thus, yet another caution for users of NWS-archived data.